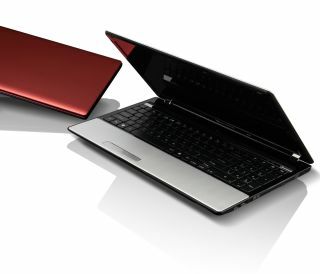 Packard Bell has announced the availability of its EasyNote LM notebook, which it is saying offers "the greatest cinematic experience". We thought that The Hottie and the Nottie was the greatest cinematic experience, but what do we know? The EasyNote LM is packed with a AMD Phenom Quad-Core N900 processor, comes with a 16:9 Diamond View widescreen display and either a DVD or Blu-ray drive. As this is a computer for cinemaphiles, there is also a HDMI slot on board, to plug the laptop straight into a TV set, and a nice and roomy 640GB hard drivce. But it's not just movies that the EasyNote gets flirty with, it is also a dab hand at social networking. Load the notebook up and there is one-click access to Facebook, YouTube and Flickr. When it comes to colours, there's something of a hyperbolic overload: you've got Cashmere Red (for energetic types), Silk Silver or Night Sky Black (for those who are chic) and Starlight White for those with "pure style". The EasyNote LM notebook has a summer UK release date, with prices starting from £499.